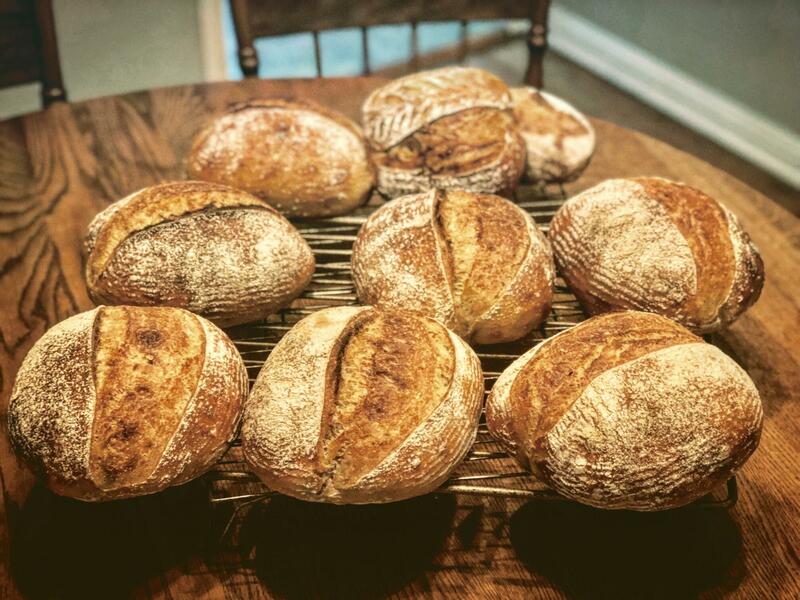 I was happy to receive an order for 7 loaves of my sourdough bread. I had never handled 2640 grams of dough - hand mixed - but also never spent over 2.5 hours baking bread in two combo sets for each bake. I would like to get a steel that will fit in my oven - 16x20 - and try baking directly on the steel. Do you have any advice on where I can get this over sized steel and whether bread would turn out the same way as from combo sets? A combo will do a better job, since it will also trap steam. If you have another way of generating steam, you don't need any specialized steel, any steel plate will work if it the appropriate thickness. Pizza addicts have a ton of info on steels https://www.pizzamaking.com/forum/index.php?topic=31267.0. I got mine from a recycling yard. I'm skeptical of this contention. I have tried both and don't see any difference in oven spring. My gas oven vents very quickly, too. I bake on stone, and per Hamelman steam just prior to and after loading, with lava rocks. Good to hear that you don't see any difference in oven spring. I'm not the only one to reach this conclusion. The conclusion is that there are a lot of ways to make good bread, and at the same time people are (justifiably) loathe to abandon something that is working. A lot of what we do is for pleasure, not just knowledge. I appreciate your input. Thank you! By which I mean, it sometimes leads to a bit of overstatement and confusion. Some say "the only way to achieve X result is X," when in fact it can be done a number of ways. Chad Robertson implies this in Tartine when he reports that he found he could only approach the pro oven effect by using a Dutch oven. I had already baked on stone when I began trying Dutch ovens, and found the results were all but impossible to distinguish, except I found my Le Creuset and Lodge Combo Cooker both tended to burn the bottoms of my bread, while not providing any better crust or oven spring than I had with stone and lava rocks. I wish you luck! It sounds like you need a new oven plan. One person I know had someone build him a natural gas fueled brick oven in his back yard, with rudimentary but effective steam injection from an old pressure cooker. He has a subscription service with about 40 clients, and he does everything himself. I would love to be that person... I have 5 years to figure out. in your oven, you can get by without a D.O. or combo cooker. Based on (I think) Lazy Loafer's post I went to a countertop fabricator and had a piece of polished scrap granite cut to size. 3/4" thick. For $20 USD. It works fabulously, and I never burn the bottoms of my loaves. A great heat sink, it will maintain the hot surface for many hours after your bake. As I don't use a D.O. I'll let someone else answer that part of your question. I like that idea... I will have one cut to my size. How do you inject steam for your bake? If your oven is electric then this will be easy. If it is a gas oven then the maintenance of steam is much more difficult because gas ovens are designed to vent the oven box with greater efficiency than an electric oven. If you search the site for "Sylvia's steaming towels" and "lava rocks", there is a ton of evidence on TFL which states the efficiency of both methods and how to do it. Another term, occasionally used, is mega steam - basically meaning dosing the oven with a huge amount of steam. In general, a wet rolled up terry towel (or two) in a pan 1/2 filled with very hot water and placed into the oven ~15 minutes before the bake will produce a lot of steam. Lava rocks, loaded into a pan (I use a 9"x13") pan and then drenched the rocks with (I use 2 cups of) very hot water - immediately after the dough is loaded into the oven will produce billows of steam. I use both methods when I bake. Oven door should not be opened until the steaming cycle part of the bake is complete, and then remove the steaming towel pan. The lava rocks will have steamed away all the water, so you can leave that in your oven if you wish. Lava rocks can be subbed out by using river rocks, nuts and bolts, your aunt Tessie's heirloom metal jewelry, neighbor's gold coin collection, etc. In either or both cases, I, and I believe most using these methods, place the steaming devices on a rack below the baking deck. Make sure when you have the baking deck installed that you leave a little room on all sides so that the steam can reach the dough easily. can't pumping that much steam into an oven that isn't designed for that much moisture cause damage to the oven? and therefore the moisture is removed from the oven over the course of the bake. here are some commenters on oven venting, and why. For taking time to explain steaming process so thoroughly!!! I have an 1960 GE electric oven so I will definitely try the lava rock method. Adam, have you considered a large Graniteware roaster for a cover and a custom cut stone? Fibrement will cut them to size. I had one custom cut and am very pleased with it. After using the light weight roaster covers, I abandoned the cast iron cookers. I think I get better results with the roaster cover. i did buy a large roaster but alas it is a tiny bit too big for my oven and I have a round stone so it wouldn’t have worked even if it was the right size. I will check your links to get a custome Stone. I saw this set up on Teresa Greenway’s video.